When searching for Compression shorts, I came across the brand Bioskin. What differs Bioskin from most of the other brands on the running market is that they are made of a thicker material with a really firm compression. Bioskin is also one of the most expensive shorts on the market. "Bio Skin is a unique, patented material designed to provide high-level compression without creating any discomfort. The material is thin and gives radial compression, so it conforms nicely to the curves of the body. Its breathable, allowing perspiration to evaporate through it, and its neoprene free, latex free, and hypo-allergenic so you don't have to worry about skin reactions. Wearing the BioSkin compression short product is a satisfying experience because it is breathable, light, thin, strong, odorless, and extremely durable. 18-20 mm Hg compression"
The shorts comes with instructions how to put them on. Right away I notices how firm and stiff the material really was. After putting them one for the first time, I realized that I probably will not be able to run in these. Material was too thick and the firm compression on upper legs were to much. I also noticed that the shorts did not fit snug enough on my lower thighs, material where way to lose in this area. I have been using these short for recovery only. Fit: Compression is very firm if you can get the fit and size right. I sent all my required measurements to Bioskin, still I can not get perfect fit. The shorts also slides down easy and I have to adjust them/pull them up every 5 minutes. Seams are very present, and for me at the wrong places. During a hike I had to stop and put my gloves inside the shorts as protection from the razor sharp seams. Waistband does not have a string to secure fit. With the poor fit, razor sharp seams and firm thick materials, I could not use the Bioskin for running. The shorts wont stay up, seams create chafing and the loose fit on lower thighs. I have used Bioskin for recovery mainly and I have to say that I can feel a great compression on the upper thighs when using them. But the adjusting of the shorts is very annoying. Room for improvements are: Flat seams, to avoid chafing. 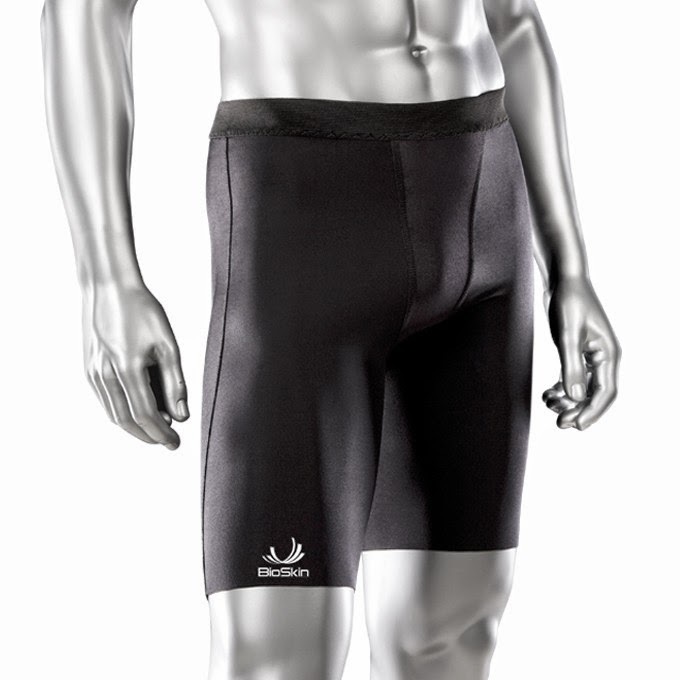 Better fit and shape of the short, so they offer compression all the way. Waistband with string. For running, the shorts material needs to be thinner. The thick fabrics interfere with the running/gait in my opinion. Poor fit, wont stay up, lose fit lower thighs. Materials to thick for running. The shorts was sent to therunningswede, free of charge for review. I play rugby in my Bioskin shorts but they won't stay up - I have to pull them up after every run. Perhaps the model with a groin strap would prevent that? But... great in cold weather and thickness prevents cuts from studs etc. If anyone has good experience of shorts for ITBS I'd love to hear it! The material is thin and gives radial compression, so it conforms nicely to the curves of the body.